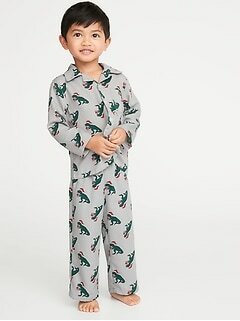 Our Christmas pajamas for kids are selling out quickly. Grab them before they're gone and check out our related products for more styles you will love. 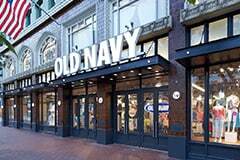 Have a very merry holiday with Christmas pajamas for kids from Old Navy. Kids' Christmas pajamas are an essential for those perfect pics to capture the festivities. Kids' holiday pajamas are a must for cozy nights and lazy mornings. Spending time with friends and family during the holiday season is one of our favorite things to do and comfy, festive PJs make those moments even better. Think reindeer, Santa, Christmas trees and candy cane stripes when selecting PJs to gift a child. Gift matching sets for fun pictures that are sure to make everyone smile. PJ sets are usually reserved for younger kids, but there are plenty of coordinating sets for older kids and tweens. 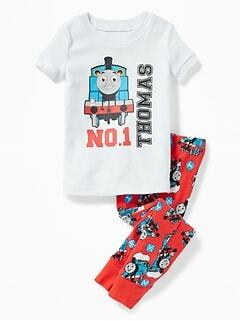 Separates allow kids to wear whatever top or pajama bottom they want, which is likely to be the case as kids take advantage of the holiday chaos. Remember that new PJs are always an awesome gift and they don't have to be holiday-themed to count with kids. Fun prints and colorful motifs give kids whimsical duds as they snuggle up and get to sleep. Send them to bed with sweet dreams as they wait for Santa on Christmas Eve. Gift Christmas pajamas for kids this holiday season and create moments to remember. Lightweight cotton makes for PJs that are easy to layer with a hoodie when it's chilly indoors. Round out your gift with a pair of fuzzy socks or house slippers that match the pajamas. The gift recipient will be set to go with new PJs for the new year. 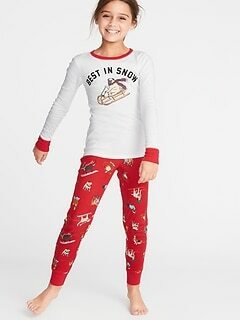 There are many winter-themed pajamas too, which boast snowflakes, penguins or polar bears for cold weather PJs that can go beyond the holiday season. Fair isle prints are another good option for PJs that stretch beyond Christmas. 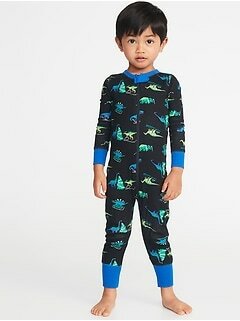 Sleep T-shirts and sleep pants should be purchased in the child's true size. Most PJ sets allow for a slightly relaxed fit that prevents bunching or tugging while the kiddo catches their Z's. Make it a holiday season to remember with cozy PJ's outfitted for the festivities.